Don't get caught in the dark in these times of heavy traffic and accidents by wearing our High Visibility Jacket With Logo from the clothing department here at Calendar Lady Promotions. Once dusk hits, it's very hard to be seen unless you're wearing our High Visibility Jacket With Logo. You can also have your business details and company logo printed upon our High Visibility Jacket With Logo so not only can the drivers see you, they can also read your advert clearly. So help to promote your business details upon our High Visibility Jacket With Logo this evening and always stay seen. 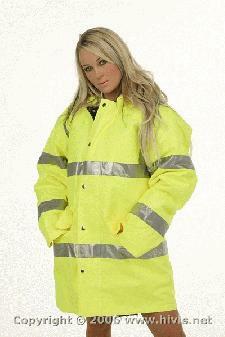 Also available in different styles of High Visibility clothing in yellow and orange. Please call our friendly team on 01989 565281 for a FREE quote today. To find out more about our High Visibility Jacket With Logo click here and fill in the contact form and we'll get straight back to you. Other promotional and personalised items besides our High Visibility Jacket With Logo click here.